eClassLive is powered by Adobe Connect, a tool that allows instructors to connect with students online at a specified time. The system includes a wide range of tools to interact with students: video, whiteboards, presentations, chat, and more. eClassLive allows instructors to teach in a virtual classroom and can be used in fully online courses or as part of a blended course. Click on Turn editing on, near top right side. Move to the topic area where you wish to add content (the week, unit, etc…) and click on the Add an Activity or Resource button. Choose eClassLive (Adobe Connect) and click Add. A new page will appear with the eClassLive settings. "Meeting title" - Meeting titles must be unique. The error message A duplicate meeting name was found on the server will appear if you have not selected a unique name. Incorporating the meeting date and the name of your course into the meeting title can help ensure that your meeting name is unique. "Description" - The intro appears just above the button allowing students to join the meeting. This is a good place for information which should be presented to students before they enter the meeting. "Meeting URL Customization" - Allows the instructor to specify the URL of the meeting. 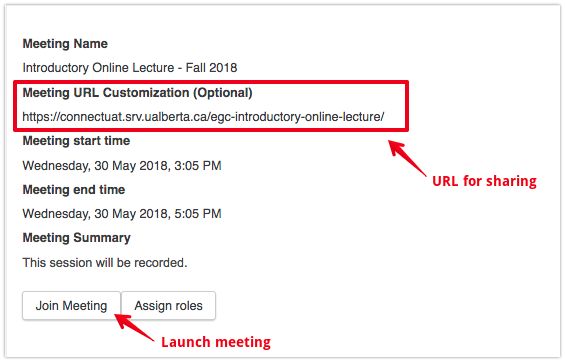 For example, entering egc-introductory-online-lecture would generate the following URL: https://connectuat.srv.ualberta.ca/egc-introductory-online-lecture. If none is specified, the system will generate a random string as the URL. "Meeting type" - Allows the instructor to specify if the activity is public or private. A public course means that you may invite other users to attend the meeting using the meeting URL. A private course only allows students who are registered in the eClass course to access the meeting. "Start time" and "End time" - Specifies when the meeting will be listed as starting and ending. Students can access the resource with the URL at any time before and after this time. This setting is used primarily to add your meeting time to the calendar in your course. "ID number" - An ID number identifies the activity for grade calculation purposes. "Grouping" - A grouping is a collection of groups within a course. If a grouping is selected, students assigned to groups within the grouping will be able to work together. "Add group/grouping access restriction" - Allows access only to students who belong to a specified group, or all groups. "Completion tracking": Activity completion is tracked, either manually or automatically, based on certain conditions. Multiple conditions may be set if desired. If so, the activity will only be considered complete when ALL conditions are met. A tick next to the activity name on the course page indicates when the activity is complete. "Expect completed on": This setting specifies the date when the activity is expected to be completed. The date is not shown to students and is only displayed in the activity completion report. Instructors access eClassLive sessions by clicking on the link for the session identified by the title they entered (next to the eClassLive session icon ). 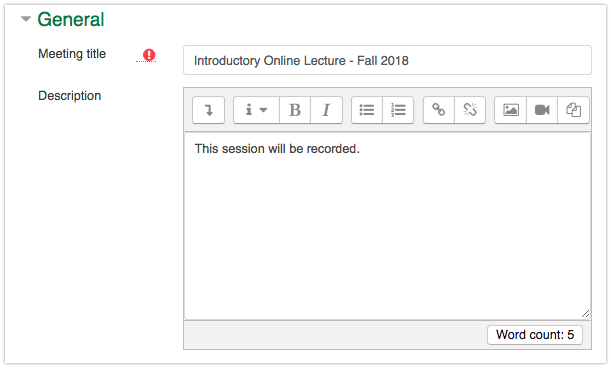 If you require users not enrolled in your eClass course to access the session, the URL to share with them is listed under Meeting URL Customization. The meeting URL is most commonly emailed directly to the required participants but it can also be embedded in web pages, non-credit courses, or within different learning management systems. Note that anyone with this link will be able to access your session. You only need to add one eClassLive session to your course; that same room can be used over and over throughout the term, year, etc. However, please be aware that if you need to record your sessions, it is recommended that you have multiple eClassLive sessions in your course to prevent a known issue with audio corruption in recordings. Note that the start time and end time of your session are only relevant to your eClass calendar. The room will stay open as long as you would like, regardless of what you set as your start and end point in the initial setup.